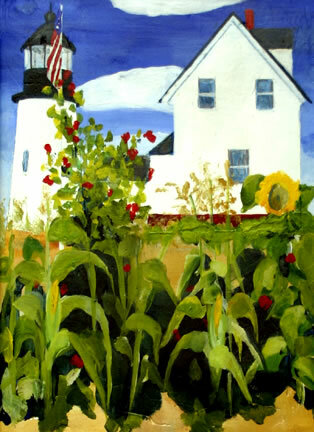 When I think of summer in Maine I think of the ocean and the gardens that flourish by the water. Since her first village street scene was selected for the cover of Down East Magazine in 1980, Deborah has done countless folk paintings of villages, harbors and small businesses, as well as publication covers and posters for festivals and centennials. Her work can be seen at her own Fulton St. gallery in Rockland ME, Drawing Room Gallery in St. George, ME, and 3 times a year at The Garage Gallery at Eastern Tire in Rockland, with her Nine Lively Ladies group. Her recent tour of Serbia, Bulgaria and Greece with Downeast Singers provided her concentrated time to sketch the villages and countryside. Toyota is distributing a handsome 2010 calendar throughout northern Japan using 12 of Deborah's early folk paintings.